The Unicredit Pavilion opened a few months ago, standing in the heart of the new Porta Nuova district in Milan; the symbol of the Banking Group’s participation at Expo 2015. The Italian architect Michele De Lucchi was chosen to design this meeting space capable of hosting cultural events, conferences, art exhibitions and music concerts. The multi-purpose structure can accommodate up to 700 people at any one time and is divided into smaller spaces, with modular components that promote dialogue, participation and experimentation. The customer’s strong focus on sustainability is highlighted by the building undergoing certification LEED GOLD and by the state-of-the-art technology applied in the project. The comfort in the Pavilion is provided all year round by 2 Climaveneta ERACS2-WQ 1502 smart heat pumps, connected to the water ring that serves the whole Porta Nuova district. The air conditioning system of the whole district is as simple as it is innovative, the first and only of its kind in Italy and absolutely cutting edge in Europe. The plant’s foundation is surrounded by groundwater, very present in fairly high levels in the interested area, setting up a water ring that serves the whole Porta Nuova district. From this piping system, based on 12 pumping wells, each building can have groundwater in its own plant room in order to have their own production of cold and hot water. “Thanks to the groundwater it is possible to create cooling and heating energy by exploiting the highest energy efficiency, with no CO2 emissions on site and zero noise emissions, as the plants are all placed in closed spaces in the basements, or in plant rooms inside the buildings” said Francesca Martinoli, associated engineer at Ariatta Ingegneria dei Sistemi, in charge of the HVAC design at Porta Nuova. 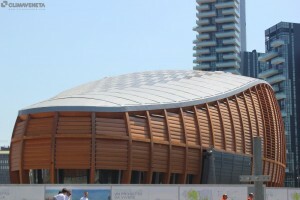 The latest building connected to the groundwater ring is the new Unicredit Pavilion. From the engineering point of view this building was a real challenge because of its completely unconventional shape with inconsistent volumes, a wooden and concrete structure and a transparent glass side. The architect Michele De Lucchi didn’t want the air conditioning units to be seen, and for this reason the HVAC designers had to proceed with a completely different approach for this project, choosing a BIM integrated design. So they have created a BIM integrated design team, with both architects and structural engineers, to work on a single 3D model in which they created the architectural, the structural and the HVAC models, adding the different systems in a coordinated and simultaneous way. The keyword in the air conditioning design was flexibility. Due to the multi-functions of this building, the designers decided to create different types of systems in the different sections of the building. 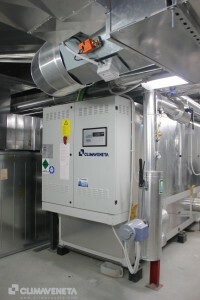 On the ground floor, seeing as the auditorium can be used for small or large events accommodating up to 700 people, they decided to build a completely modular air-air system with an AHU installed in the technical and mechanical floor, connected to ceiling air ducts in the basement. Then from the basement ceiling there is a network of air ducts serving various air plenum placed under the floor, thus making the plant almost invisible apart for some grids on the floor. Furthermore there are some separation sets which divide the air flow on the basis of the different configurations of the space making it always possible to have different temperatures and humidity conditions in every room. To maximize the energy efficiency of the air conditioning system, making it really adaptable to the real presence of people, they placed some CO2 probes directly in the auditorium. On the first floor there is a kindergarten, with totally different needs and loads. To maximize the children’s comfort, the best option was to design a system with radiant floor panels and primary air flow, fully integrated with the architecture of the building. Finally, on the third floor dedicated to the lounge, the client wanted to have some free space, and for this reason they designed a floor plant again with some fan coils placed under the level and some primary air ducts on the ceiling but perfectly integrated into the wooden ribs to combine comfort, flexibility and low aesthetic impact. The whole project was a big challenge in terms of engineering and technology: “Most of the components of the Pavilion required a remarkable job in designing and engineering, making the whole construction process quite difficult” explained Serena Massimi, Head of UniCredit Pavilion Development and Management. But the final effect is brilliant in terms of sustainability and architecture and the Unicredit Pavilion now has the ambition to become the permanent pavilion of a Milan that changes, and that Climaveneta with its efficient solutions is helping to change.